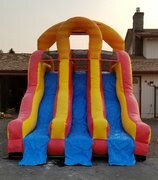 When in comes to the best inflatable slide rentals in Tacoma, you just can't go wrong with Inflatable Event Professionals. IEP offers the best blow up slides around. These inflatable slides are great for all ages, from children to adults. The perfect addition for large events, because unlike other items, slides have a constant flow of guests. Feel like turning your backyard into a tropical oasis? Then take a look at our Tropical Palm Tree Slide. 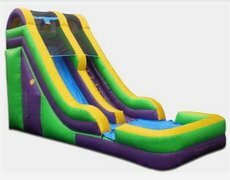 Or double your fun with our Dual Lane 16' High Slide. All of our slides meet or exceed industry rental standards and are manufactured by the top companies in the inflatable industry. 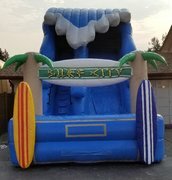 Whether you're throwing a party in your backyard, a day of fun at your school or a corporate event, you can rest assured that these great inflatable slides will be a huge hit. 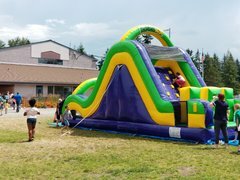 Inflatable Event Professionals are also happy to provide delicious concession, bounce houses, combo bouncers, interactive games, obstacle courses and more. Also, if you're looking for inflatable water slide rentals, take a look at our water slides page. Who doesn't love an inflatable slide? These fun slides will be perfect for keeping everyone entertained on those long summer days! If you are looking for more than just a slide, please check out our awesome combination units. Browse the selections below and click on the title or image for more information and to make a reservation.